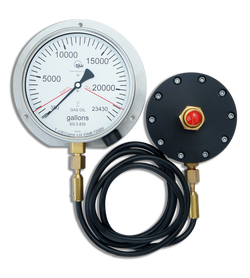 This gauge is mostly used to measure; Fuel oil, Diesel, Paraffin, Lube oil, Chemical process plant, Corrosive liquids, Printing inks, Kerosene, and Potable water. This gauge works on a hydrostatic principle, where pressure from the head of the liquid is senses by the transmitter and is transmitted to the indicator via a capillary tube giving a continuious reading. This gauge is mostly used to measure; Chemical process plant, Printing inks, Water treatment plant, Slurries, Latex compounds, Corrosive liquids, Food products, Liquid sugar, Molasses, Potable water, and Heavy fuel oils. The gauge is suitable for installation on any shape or size of storage vessel that is freely vented to atmosphere.